Impact handling, the exclusive UK distributor for Konecranes Lift Trucks, has seen a recent surge in demand for its largest 60 tonne machines. The purpose-built heavy duty Konecranes forklifts, capable of handling the largest and most demanding of loads, have helped enable ambitious projects across the construction and industrial sectors. Impact worked closely with their customers and the Konecranes factory team to carefully design the customised machines to perfectly fit their intended applications. A comprehensive delivery and training support programme ensured the machines were efficiently integrated into their new environments, whilst further peace of mind was provided by Impact’s extensive and readily available UK parts supply. The first of the giant machines was commissioned for Harsco Metals at Liberty Steel’s Rotherham works site and fulfils a crucial role as part of the revitalised UK Steel industry. The second 60 tonne machine entered service as part of the innovative Aberdeen Harbour Extension Project (AHEP). The AHEP, saw Spanish marine engineering specialist, Dragados, seek to scale their proven breakwater ‘Accropode’ technology to new heights. Bringing with it the need for an even larger handling solution. Konecranes heavy lift trucks, having repeatedly proven their reliability across all of Dragados’s previous global Accropode projects, were the natural partner for this even more ambitious and ground-breaking new project. Not only did the massive 40 tonne Accropodes challenge Konecranes’s engineers with their long load centres, but the construction site required the lift trucks to travel a remarkable 800 metres fully laden, over a significant gradient. 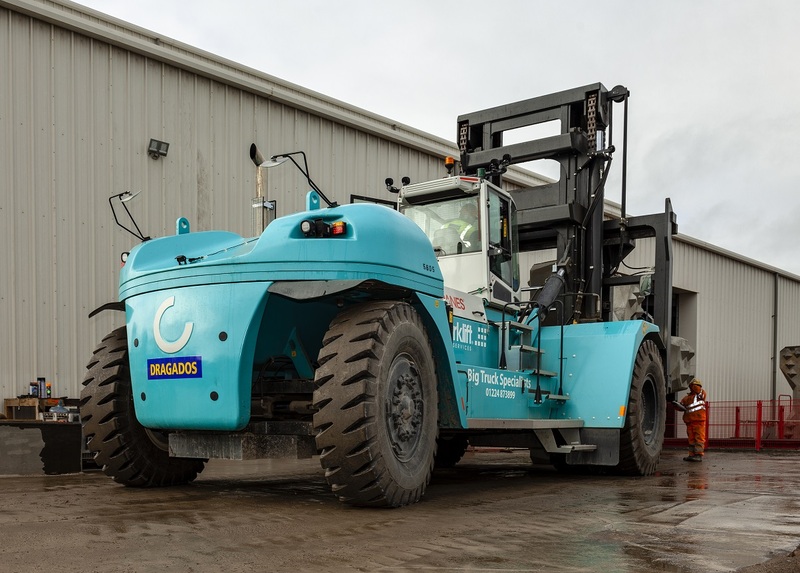 Impact’s official Konecranes dealer for Northern Scotland, Gray Forklift Services Ltd, worked closely with Dragados to overcome these logistical and site handling challenges to ultimately enable the AHEP to meet its operational objectives. The project sees Grays supply all material handling equipment for the Aberdeen Harbour Extension site and continue to extend its dominance of the heavy truck industry across the region. Impact sees the increase in demand for this latest generation of ‘Super’ lift trucks as yet further evidence of customers’ relentless appetite for new ways to achieve greater efficiencies – and subsequent cost savings – from their existing processes and operations. Something Impact are uniquely positioned to deliver via their market-leading flexible contractual and financial solutions and their fully customisable range of premium handling equipment.